Joshua Harris (no apparent relation to this guy) is an ordained IFB evangelist out of Gospel Light Baptist in New Mexico. 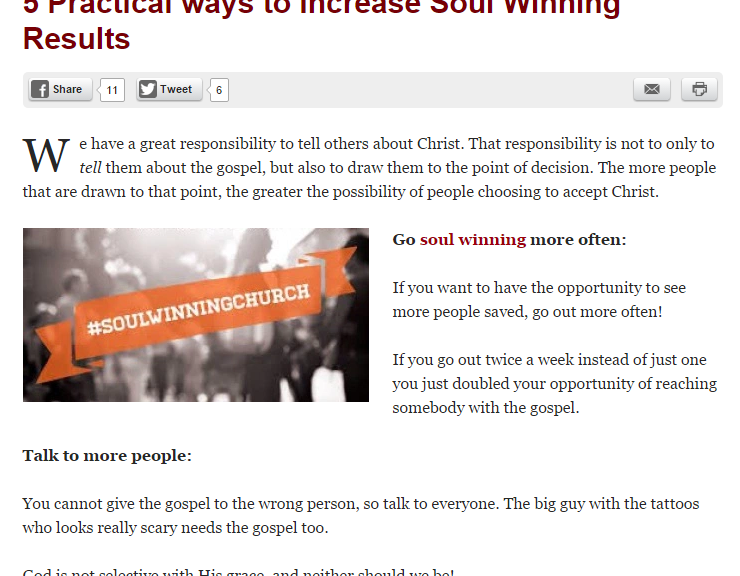 When I saw that Josh had written a list of five practical ways to increase soul winning results I naturally thought that as someone who is a paid professional soul winner, he’d have some interesting insights. 1. Do it more often. 2. Do it to more people. 3. Do it more often. 4. Do it to more people. 5. Do it to more people (and a lot more often). You’d think that a crowd of people who’s mandate is solely focused on scouring all of land and sea to make disciples would at least have developed some really good techniques for badgering, bullying, and buttonholing people into the kingdom. But this? Even used car salesmen have better material than this. We haven’t done a Friday challenge in a while so instead here’s a discussion question to get Monday started right. On the Facebook comments under the last post somebody used a phrase “tender hearts” which in my experience is just code for “easily swayed.” Children are said to have tender hearts (which is why so much focus is put on converting them early). The grieving, the poor, and the uneducated are also seen as having more tender hearts than their more emotionally resilient, affluent, and better educated counterparts. So here is the question: what are the ethical boundaries on evangelism? Is there a wrong time? A wrong method? At what point does the message stop being an invitation and become instead a manipulation? 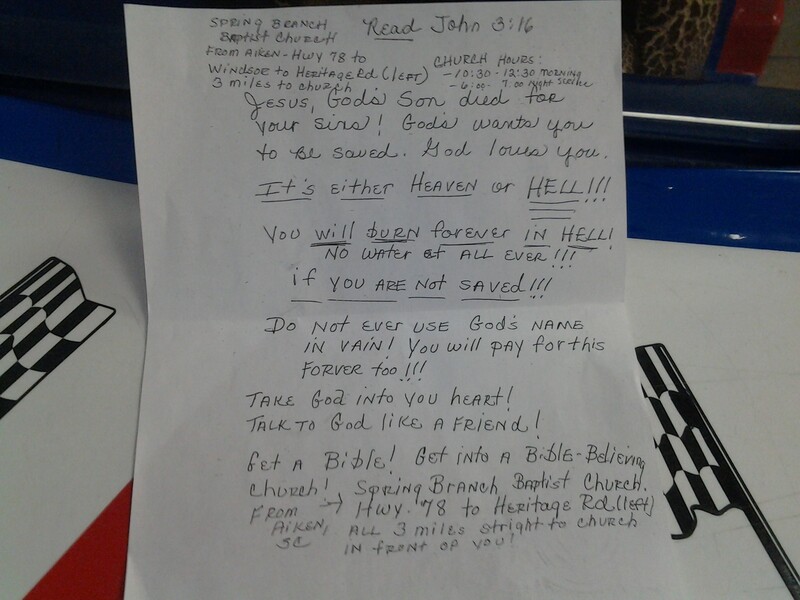 The following picture was passed only by an SFL reader who reports that it was found at a kiddie ride inside the lobby of a Walmart. So what if the church van has four bald tires and hasn’t had a tune-up since 1978? We’re going to drive these 8 teens the 1400 miles to Mexico anyway.Â If we can get one person saved, the risk of death is all worth it. Look, we may be serving those VBS kids snacks that expired in Clinton administration…but if between bouts of throwing up one of them gets saved, it’s all worth it! We spent $148,987.50 on printing ten million copies of a gospel tract with three misspelled words and six verses taken completely out of context…but if one person gets saved from reading it, it was all worth it! 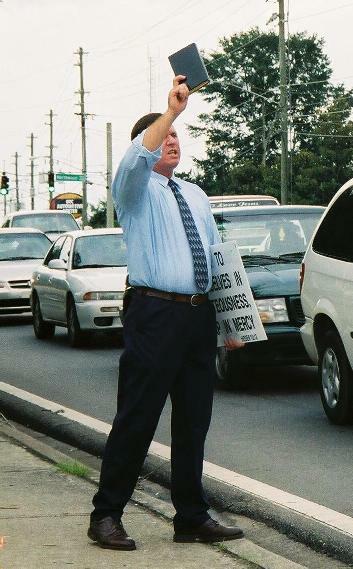 Every member of our church has been standing out on a street corner yelling gospel verses at traffic every weekend this year at a total cost of 85 man-hours, two citations for public disturbance, and a whole lot of dry cleaning. Not one person even slowed down that we know of…but if one person gets saved from from the seeds we planted, it was all worth it. But what if it isn’t? What if the lost getting saved really isn’t really up to your efforts? And even assuming it totally depends on your evangelism antics, what if unsafe and antiquated methods drove a hundred people away in the process of winning one? That’s a net loss of ninety-nine souls in the process of winning one. Worth it? Now I know that fundies who are reading this are going to accuse me of hating the lost and being too fat and lazy to get off my couch and go soul-winning. But if I have managed to make just one person re-think their approach to outreach…it was all worth it.